This is my No. 6 Value Pick for 2017. Before I start, I would like to share that we do not only write about mid and large cap stocks. Some readers have asked us why Tradeview do not write on small cap stocks. To us, as long as the stock has solid fundamentals, strong balance sheet and growth prospect which is currently undervalued, I will definitely write regardless small, mid or large cap. Today I will be writing on the smallest cap stock I have ever written. Of course, I will give an upfront warning, as this is a penny stock and on a turnaround play, this stock is higher risk compared to all my other value picks. So for those who have low risk tolerance, you can skip this. Scope Industries Bhd, is in the business of Eletronic Manufacturing and Palm Oil. For its manufacturing division, it is one of the largest local based PCBA companies serving reputable OEM and MNC. The company had humble beginnings building the business from a small shop lot to its own manufacturing facilities and plant with over 550 employees. As for the plantation division, the company has been in the industry since 1990s. It is doing well recently in line with the CPO price. Although volume has fallen, the higher average selling price helped to deliver and contribute to the company's bottomline. Looking at the 5 year chart from 2013 to 2017, you can see the Scope has fell into the red between 2013 to 2015 due to falling revenue and net profit. 2016 was the first year it broke the trend and achieve a net profit of RM1.6 mil. As of the latest quarterly results for FY end 2017, 2 quarters alone have already exceeded the full year profit of 2016. 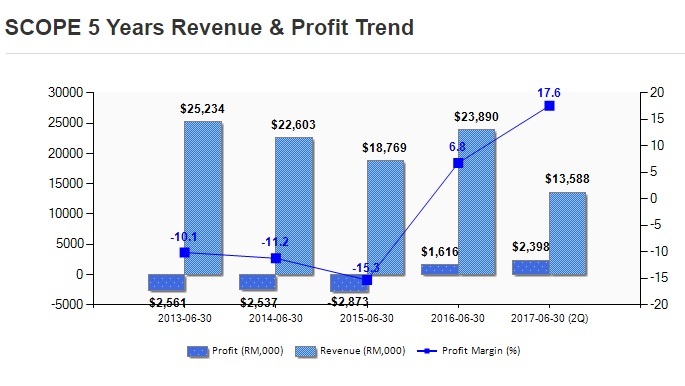 The profit margin has also improve significantly in line with the increase in revenue. 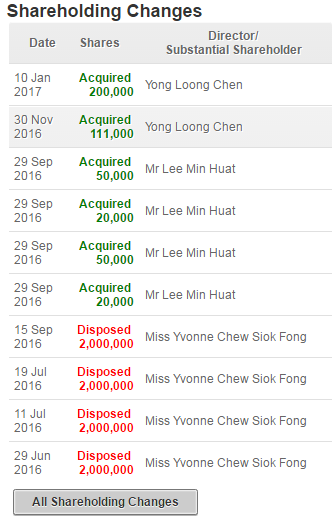 Previously, Scope was also dragged down by its plantation unit. 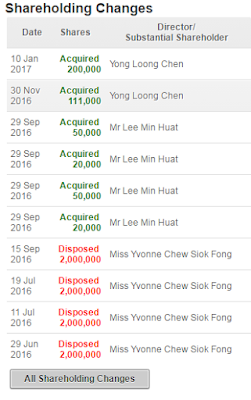 Past few quarters, the plantation unit has been churning positive results. I believe the coming Q it should be able to maintain. I like Scope for many reason. Firstly, it has been around for some time. Secondly, it is a turnaround play coming from a low base. Thirdly, the company appear to have found its footing. Hence, I believe the future prospect is intact. I am cautiously optimistic for it to maintain its profitability in the coming QR. 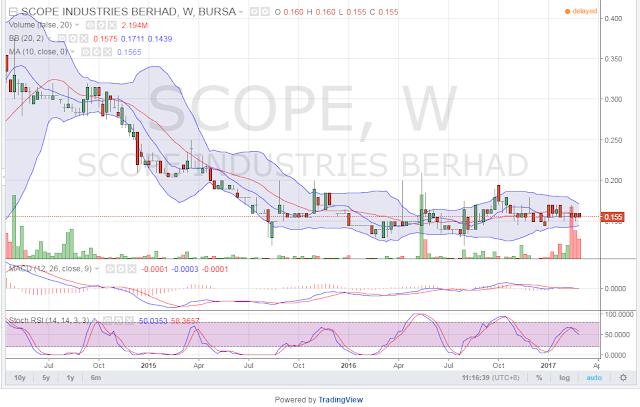 If Scope successfully pulled it off, it will be the first consecutive 4 quarters in a row that Scope delivered profit. However there is one very important reason I am willing to consider such a small penny stock. Unlike others in the market which has high debt, poor earnings, ugly balance sheet, Scope's balance sheet is relatively strong. It is a net cash company and the cashflow is healty. 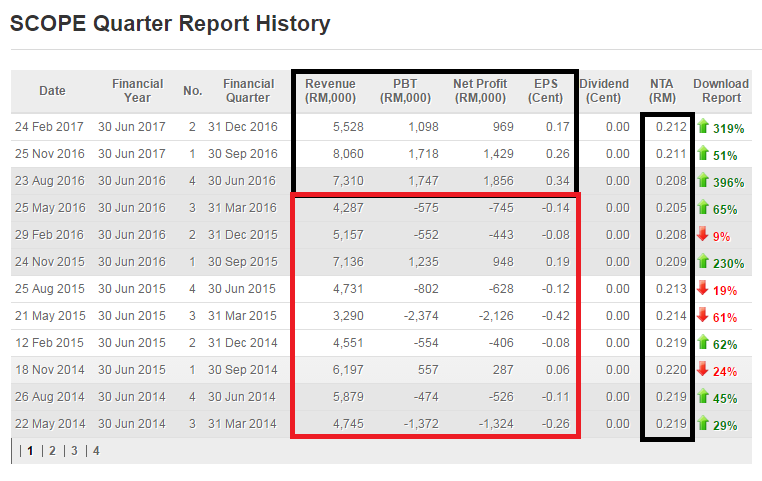 Recently, due to the improvement in operating profits, the company net cash position strengthen further from Rm4++ million to RM9++ million. 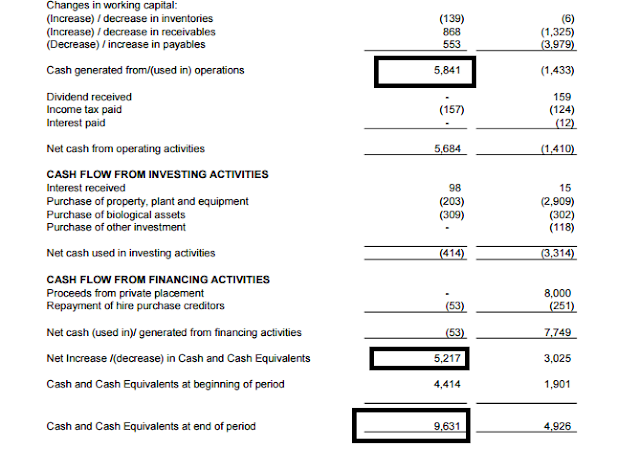 This increase in cash position is mainly from the operations and not from any placement / rights / corporate exercise. Furtheremore, Scope has NTA value at 21 sens. Hence, there is less of a concern as a penny stock status. The 2017 prospects by Scope looks promising as well. For the manufacturing division, the positive is the company plans to expand the customer base. Additionally, Plantation division have opened up new harvesting area which will help boost the topline and bottomline. Given the management confidence of being able to deliver a positive performance to FY June 2017, I think it is worthwhile to consider investing in the company for the mid term basis as I am sure the share price will not stay at current level. The selling by substantial shareholder of the company has abated. 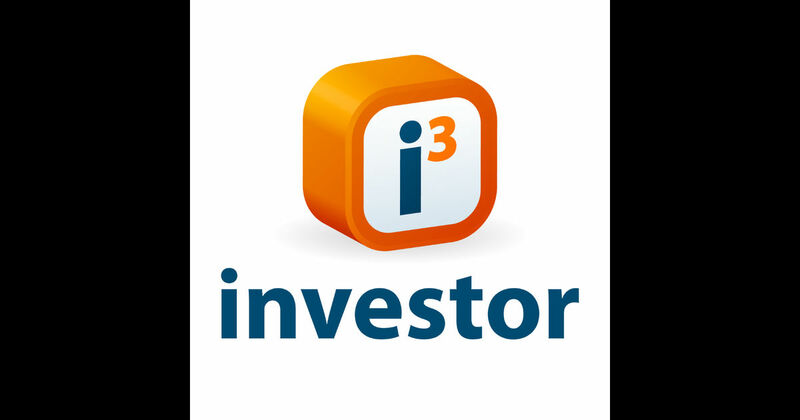 In fact, there is an increasing and gradual buyback by the shareholders. The average purchase price is around 17 sens which is higher than current price of 16 sens. Hence, entering at current price is rather safe. Looking at the chart of Scope, in my view it has found a bottom somewhat. Which means the downside is limited compared to the upside. 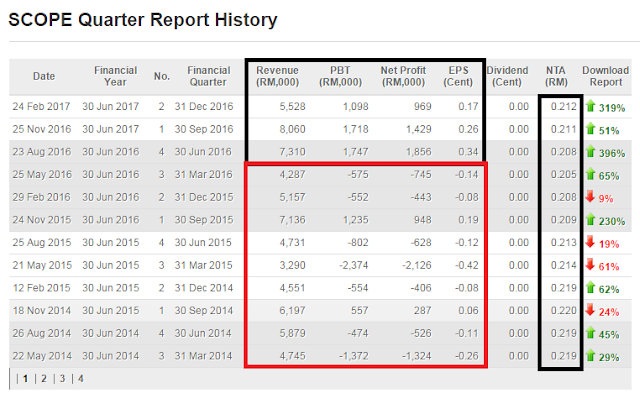 Since middle of 2015, Scope has falled from 40 sens to currently 15.5 sens due to downtrending earnings. With recent positive quarterly results, it has a good chance of breaking out 16 sens resistance to move towards the recent high of 19 sens. There is no reason Scope cannot return to challenge its high of 19 sens with a full year of positive earnings. At current price of 15.5 sens, Scope is trading at a multiple of 24x. However, this trailing valuation takes into account of a quarterly loss. With EPS total around 0.63 (incuding a loss), I believe there is a good chance they will make a profit in coming Q with estimated EPS around 0.2-0.4 sens. Should that happens, the full year EPS will be around 1 sen and applying a multiple of 20x (factor in the net cash position), there is a possibility that Scope can move towards 20 sens. For now, this will be my initial TP pending the observation of the coming quarter results. *Please note this is a penny stock and tunaround play. Hence the risk is higher. For those who do not have such appetite, feel free to skip.